Combine first 8 ingredients in heavy bottomed, medium sized, saucepan. Bring to a boil, reduce heat to low and cook, stirring frequently for 30 to 35 minutes or until rice is cooked through. Remove from heat and stir in vanilla, orange zest, and ¼ cup heavy cream, if using. Cool to room temperature then transfer into a glass bowl. Cover tightly and refrigerate until ready to serve; may be prepared up to 2 days in advance. Combine mascarpone cheese and maple syrup in a small bowl, mix with a wire whisk. Add in heavy cream, mix well to combine. Cover and chill until ready to serve; may be prepared up to 2 days in advance. In a large skillet, heat 2 Tablespoons butter infused olive oil over medium-high heat. Add figs to skillet and cook briefly just to sear, 60-90 seconds. Transfer to a plate and set aside. Carefully, deglaze the skillet with orange juice and Vermont Maple balsamic vinegar. Cook over medium heat to let excess liquid evaporate and the pan sauce reduces by a third. Remove from stove, add the figs and gently toss to coat. Just before serving, mix rice pudding with a spoon. 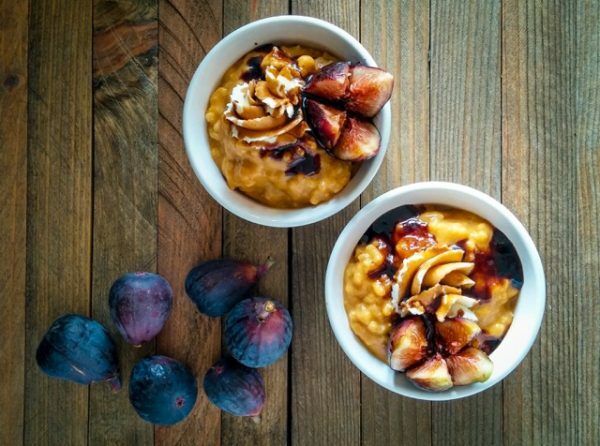 Serve rice pudding in small bowls with a dollop of prepared mascarpone mix. Garnish with a few fig quarters and drizzle with some balsamic glaze. For an extra special touch, sprinkle each bowl with a pinch of Cinnamon.